8mm Forum: More fiddling with the Wolverine! This is topic More fiddling with the Wolverine! in forum 8mm Forum at 8mm Forum. Although changing the film path did seem to improve the jerky image it's still not consistent. A scan started with me pressing the default setting and that gave me the frame line in shot. Stopped the scan and adjusted the frame using the settings. And resumed scan. On playback that first bit of scan was still jumping. But the resumed scan is stable! 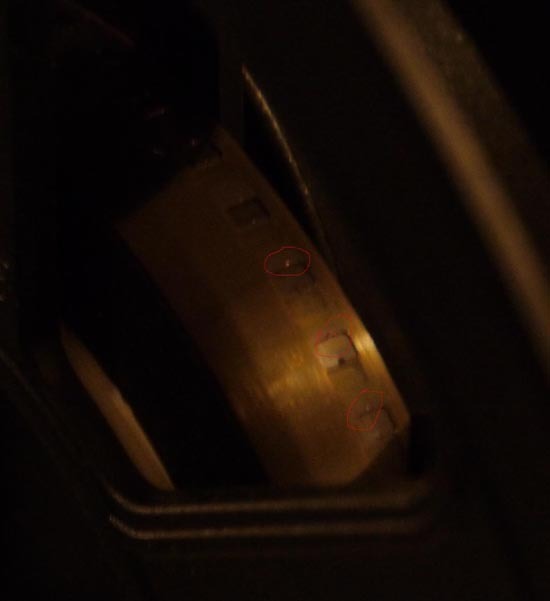 Does adjusting the frame position have any physical effect on the film and the claw position? But them because of this flickering or strobing effect you get on certain shots decided to do another scan using the exposure of +0.5. This seemed to lesson the flickering but the jumping image was back in places! A third scan trying -2 on the exposure was more flickery but the jumping was better again! When I look at the footage in playback on my computer you can see that on the jumping footage every other frame is blurred with the alternative frames sharp. And on the flickering bits 3 frames are correctly exposure with the 4th much darker. And it carrys on like that for the affected scenes? I am already up to 25 on the scanners counter and that's just trying to get a half decent scan from two 50 footers! Projecting on a screen and filming that might be the only way to go! The biggest snag I have had from that method is image sharpness. Need to work on that! After I tried using a simplified film path on the scanner I did run a bit of another film through and there appeared to Bec less obvious damage to the sprocket holes. But not completely convinced I would trust it! Those scans looks really good Werner. Such a shame that the manufacturing quality control of the Wolverine is so poor. 1) Just think about all of the money that Wolverine is saving by using it's customer base for intensive product testing and development. Wolverine owners can consider themselves 'beta testers' - isn't that fun? 2) Then, after we uncover all of the bugs, weaknesses and design flaws, Wolverine picks two or three of the biggest problems, and resolves them in a NEW release/version of their product! Imagine the pride we Wolverine owners then have, knowing that we helped make a better (?!) product... and that as a result, we've developed an enhanced personal vocabulary of obscenities, as well as blood pressure control techniques! Jus' adding a bit of humor, folks! Although quite difficult to photograph because the damage is quite small and subtle hopefully you can just about see it on this photo. It is circled in red. Each sprocket hole has a slight raised indention after running through the scanner. The sprocket holes were perfect before the scan. The last scan I did on a new film where I used a simplied film path has a hint of the damage in the same place but less obvious. Perhaps running the film into a box might remove this damage altogether. I am very surprised if there are no other Wolverine owners who have not got similar damage. Its needs very close attention to the film and a watchmakers eyeglass shows it clearly. So perhaps just giving a general look you might not realise. Still puzzled how just changing the frame adjustment after I first started a scan by stopping the scan and them adjusting and resuming gave a more stable scan after the adjustment. As I did not think adjusting the frame had any physical effect on the film?